Mobile World Congress It's based on blue-laser technology, but that's where the similarity between the V Media disc and both HD DVD and Blu-ray Disc ends. 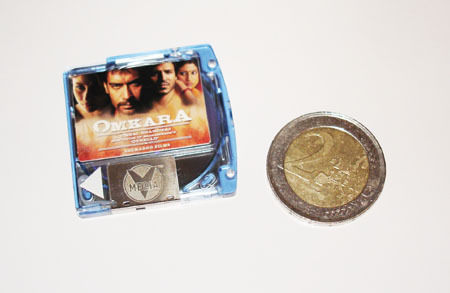 V Media holds just 1GB of data on a disc with a diameter of about an inch and a half and a casing reminiscent of Iomega's ill-fated Clik. Developed by US company V Media Research, VM discs use the H.264 codec to deliver a claimed better-than-DVD playback quality, with video content encoded at progressive scan 720 x 576 - 576p. 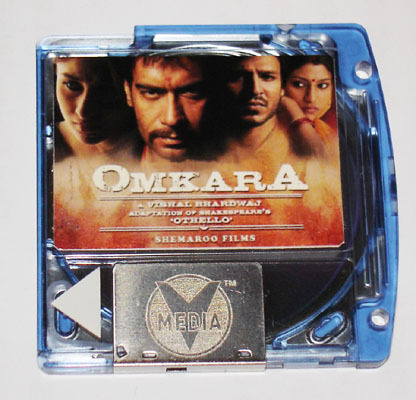 The discs are made by Cinram, one of the world's biggest disc replication companies. The drives come from Panasonic. 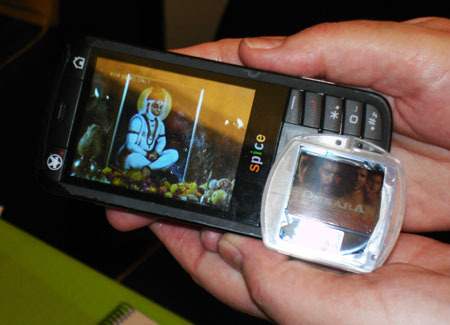 Both have found a home in the plainly styled Movie Phone, a chunky handset announced today by Indian phone company Spice. From photos, you'd think the Movie Phone much like any other media-centric handset, but it's rather bigger, thanks to Panasonic's drive, which opens out of the back of the device much like Sony's UMD drive opens out of the PSP. 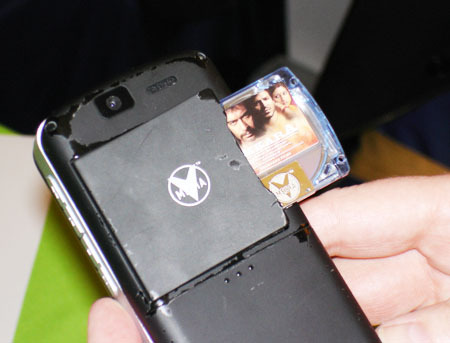 Despite the sub-DVD capacity, VM's 1GB of storage - held on a single layer - can hold a full-length movie. V Media Research reckons it'll have a dual-layer version - recordable discs too - out in 2009, in part, it said, to win over extras-obsessed Hollywood studios. That's a way off yet - for now we have to question the rigour of disc and drive. But if punting them out into the Indian market doesn't test that, we're not sure what will. Spice's Bollywood content chums reckons VMs will go on sale for the same price as a regular DVD over there, but with the benefit of play-wherever-you-go flexibility. Higher picture quality too, of course, but that's less of an issue when you're watching on a small, 2.8in screen, even one capable of showing 262,144 colours. Spice has thought of that - the Movie Phone will incorporate not only the usual 3.5mm headphone jack, but a TV output port. The unit's battery life is claimed to be 3.5 hours when playing movies off a VM. So while V Media Research readies a more West-friendly version, Spice tests VM technology in a country where computer ownership is small and the number of people able to download movies from a Steve Jobs-style online store even smaller. Even if VM doesn't find a home over here, it's hard to imagine it not appealing to a population devoted to both mobile communications and the cinema. Spice hasn't said how much it will charge for the Movie Phone, but the handset is due in a couple of months' time.